Laguna Keyes is a spending North Myrtle Beach resort that is located right on the oceanfront. This North Myrtle Beach resort is at the end of 57th Avenue North in the Cherry Grove section of North Myrtle Beach, South Carolina. Laguna Keyes is a beautiful landmark in a popular part of town and makes a magnificent destination for a family North Myrtle Beach vacation. The Cherry Grove Fishing Pier is nearby this oceanfront resort and that is sure to add fantastic memories to your North Myrtle Beach vacation. There are two pool decks at this North Myrtle Beach resort that offer plenty of fun in the sun for families. The oceanfront pool deck has a beautiful swimming pool. When you splash and play in this pool you can hear the ocean’s waves crashing ashore. There is also a covered kiddie pool on the oceanfront at Laguna Keyes. 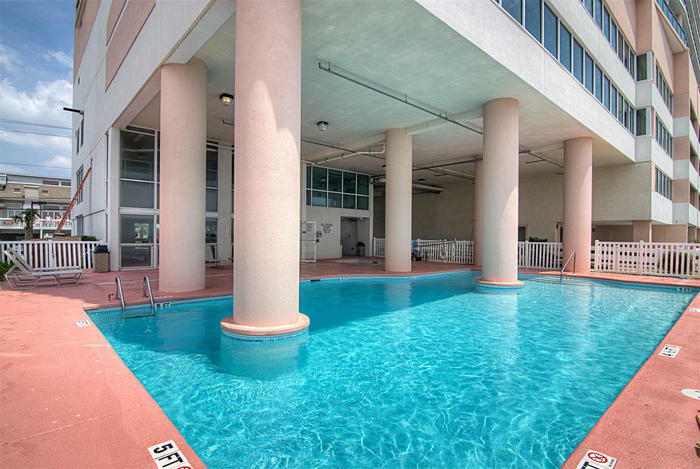 The second pool deck at this North Myrtle Beach resort is on the sixth floor. This pool deck is great for kids because this is where the lazy river and kiddie pool are located. There is also a hot tub and a whirlpool on the sixth-floor pool deck. Additionally, Laguna Keyes is a North Myrtle Beach resort with an indoor swimming pool so if you need a break from the sun or if it is just a little chilly outside, you can still go swimming during your North Myrtle Beach vacation. Laguna Keyes is a North Myrtle Beach resort with seven floors of North Myrtle Beach vacation rentals. There are five levels of parking garage at this North Myrtle Beach resort so returning to your North Myrtle Beach condominium and finding a parking space easily is par for the course at Laguna Keyes. Stairs on both ends of this North Myrtle Beach resort as well as a bank of centrally located elevators keep guests retreat to their private condos in North Myrtle Beach, SC after being outside or in the parking garage. Each of the North Myrtle Beach condo rentals at Laguna Keyes has a balcony with nice views. Most of the North Myrtle Beach vacation rentals face the Atlantic Ocean so you have a front row seat to an oceanfront sunrise during your North Myrtle Beach vacation at Laguna Keyes. The oceanfront fitness center at Laguna Keyes has inspiring views so you just might want to get up and go get in a workout during your North Myrtle Beach vacation. Watch the waves roll ashore as you do some cardio exercises or get on the treadmill for a little while after dinner and watch the stars fill the nighttime sky at this North Myrtle Beach resort. Elliott Beach Rentals is not affiliated with onsite management or the HOA of Laguna Keyes.